Puchong, Jan 11: I was asked by a young reporter from The Malaysian Digest yesterday what I thought of Salleh Said Keruak's Jan 9 posting This is called Globalisation. Though the Communications Minister did not make any reference to anyone on the posting, I thought it was clear that he was happily jabbing at Dr Mahathir Mohamad who insisted in a Jan 6 posting that Prime Minister Najib Razak and Johor were selling out to China. The Tun used to use Singapore as a boogeyman to piss us off or of scare us off or to divert the nation's attention. China is officially his new (and bigger) boogeyman. Unfortunately, it is also another complete U-turn by the Old Man. His first for 2017. Read the Digest's full story H E R E.
Read Dr Mahathir's FDI, h e r e.
Salleh, in his posting, cited the irony of the British auto industry which enjoyed a record year last year but only after the Mini, the Land Rover and the Jaguar - all proudly British - have been sold to foreigners. Even Volvo is doing better since the Chinese took over the company whereas it was on the verge of closing down earlier, the Minister wrote. 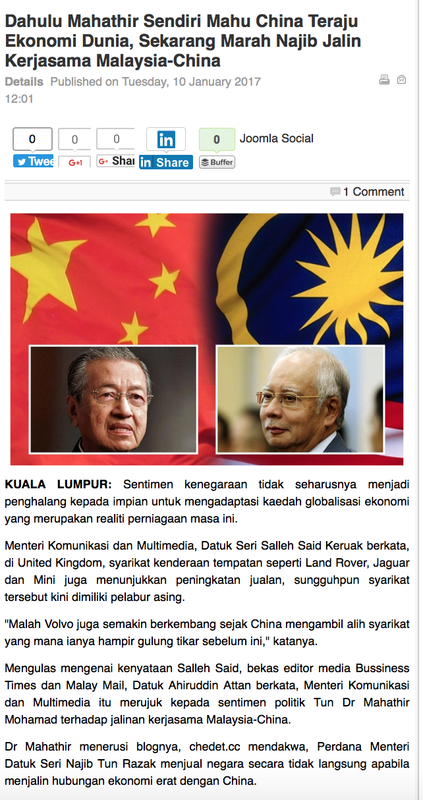 Mahathir knows what Salleh is talking about and for that reason I think he's going to let Salleh go this time. The Old Man did (or tired to do) a China long before the Chinese: he bought Italian pride MV Agusta and Britain's Lotus in the good old days of his premiership. keep on mengelirukan umat Malaysia. Semoga segalanya semakin terang. If people say that "too many" projects in Malaysia are by the Chinese, then how many would be "just right"? Among the realities that we are living with in the world right now is that China has the resources, as well as it being a major buyer of resources that it requires. We as the small fry must accept the realities and adapt accordingly to ensure that we too will benefit from situations. Or we can choose to be hostile and make things difficult for China's investors. There will be less of their companies coming in as a result. But will that be beneficial to us all? The fact that these China companies are willing to risk their capital, time and energy in Malaysia says something about their confidence in the country and its potentials. Sure, it may be better if the investments are more balanced. I'm very sure Najib would also be welcoming of companies from the US, Europe, Japan and Middle East coming in with big projects. In fact, I believe he will also welcome the Taliban should it want to come in with capital to develop some new port and township in Malaysia. Right now it's the Chinese who are willing to invest in a big way. Would be great if US and European companies were to come in too and counter-balance the Chinese. But they have their own problems, priorities and plans. They might do so in future but for now it's better that we try to make the best of what is on the table. Rather than scaremongering about China buying over Malaysia, the more productive thing to do is to monitor these companies. 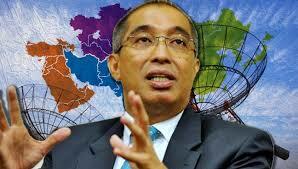 Among other things, to ensure that the benefits reach as many Malaysians as possible. And not just the few with access to the government and investors. Whether its globalization, sentiments, national pride or not... just wait when those Mainland Chinese started to swamp our shopping-malls... e.g. in Johor Bahru... strolling with their pet-dog in trolleys. Me... I've not problem at all. I could even have my own lunch, sitting at the same table with a friend who is having grilled-pork. Recently, I went to hardware shop to buy a wheel barrow. I was presented with 2 options:Yellow colour which is local made or Green colour which is made in China.Of course, the yellow colour one is more expensive. The China made has many problems.Among them is the wheel is easily damaged and can only be replaced with the original one from China due to size of the wheel.The metal sheet is also thinner as well as the overall size. The hardware owner did not recommend buying the green colour one and instead offered higher rebate for the local one. It is understood that most products made in China do not conform to major international standards, thus making alternative replacement of spare parts almost impossible. Now, we are going to buy trains system from China. The system consists of the coach, track, bogey, mechanical n electrical system, IT or computer system, washing system n etc. Have the government and the experts fully studied other than the construction aspects,the long term requirements of the new train system? If BN jatuh, hope power not still with Maddie. We can call for a special commission to investigate and put him and his family to trial. Suggest Maddie balik Kerala or Malbari or Pakistan, whereby his root was. Ooiiii Mat Cendana..... Biar China berleluasa melapah tanah dan harta rakyat. Bila dah tinggal tulang, kudis pun tak nk bertapak. Fikir lah sikit, guna otak bukan jadi keparat yg tak fikir keturunan kita di masa depan. Negara kita, hak anak cucu kita. Bukan hak penyamun dan kumpulan 40 pencuri. tak habis dgn dedak korang tuh..jatuh bn jatuh juga org melayu..melayu mmg seronok jadi loosers...dah jadi satu hobi pulak fitnah mengfitnah kpd bangsa sendiri. untuk pengikut mahathir sekalian, selamat mengundi lim kit siang. U are accountable to your own action rockybru. Don't regret later.